Considered by many to be the most beautiful spot in Guatemala (although the residents of Lake Atitlan might have something to say about that), Semuc Champey consists of a series of tiered limestone pools which form a ‘bridge’ over the River Cahabon. Perfect for a relaxing swim, and surrounded by beautiful vistas all around, Semuc Champey would attract a great deal more visitors (and lose much of its appeal) were it not for its relative isolation. 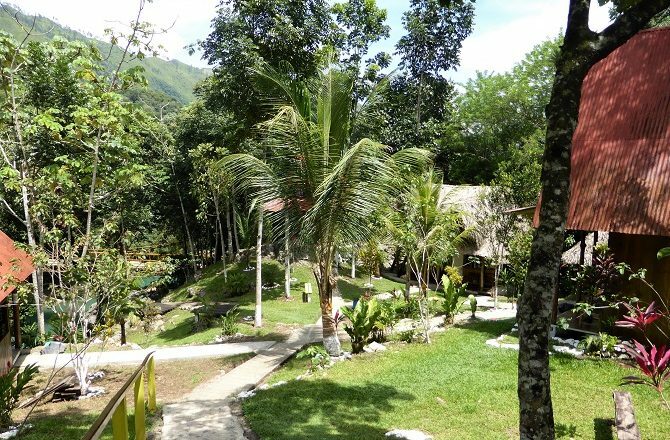 Located within the Alta Verapaz department, this idylic site certainly isn’t easy to get to at some 3 hours’ drive from the nearest major town, Coban, with half of that journey along rough, unmade roads. 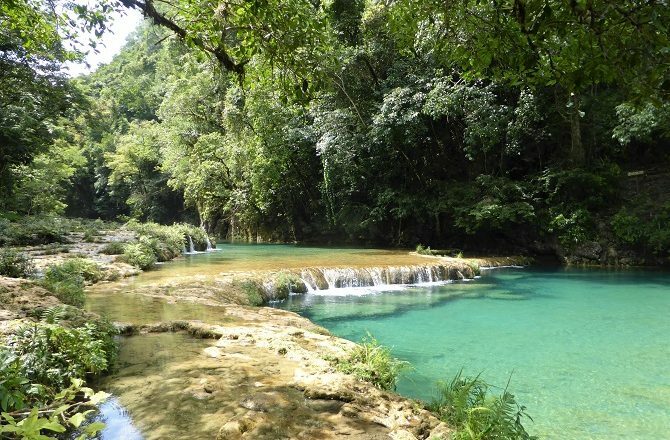 Although it is possible to visit on a day trip from Coban, most visitors will spend at least a night and combine it with a visit to the Lanquin Caves which are en-route, Accommodation is available at both Lanquin and Semuc Champey; my recommendation for the latter would be the charming Portal Semuc Champey, overlooking the River Cahabon and within easy walking distance of the pools. 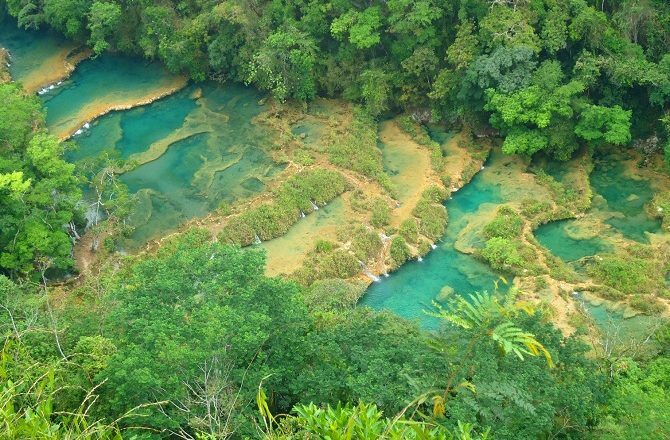 There is no entrance fee to enter Semuc Champey although ‘tips’ are requested by the local community who effectively manage the site; 30Q (approx £3) is adequate. From the entrance, it’s a scenic 10-minute walk along a wooden boardwalk to the first of the pools with free changing rooms and toilets located en-route. 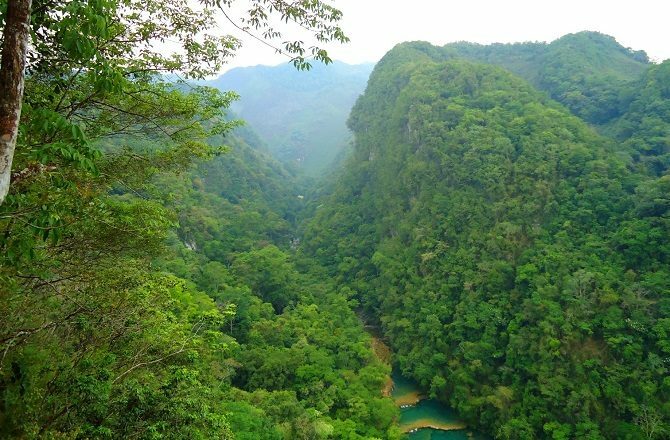 Alternatively, for those feeling fit, a 45 minute trek (known simply as El Mirador) to the top of the valley overlooking Semuc Champey affords stunning views of the both the pools themselves and the surrounding, verdant valleys and hills. If you’re after a bit of excitement, arrange for a guide to take you to the cave entrance from where the River Cahabon shoots out from underground. However, as this is not without danger it should never be attempted alone and, even then, bear in mind that the nearest hospital is a really, really long drive away. Perhaps best to just paddle around in the many tranquil pools.